Barking Up the Wrong Tree! Humph… Things aren’t always what I imagine! I had always believed that Todd’s Backyard was an ancient cactus forest full of prehistoric plants holding the secrets of the distant past. 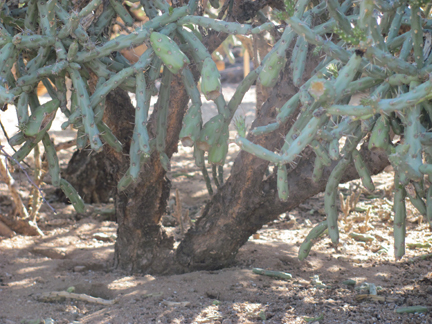 Perhaps this massive cholla helped sustain the Hohokum Indians that made their homes here. Maybe this giant pencil cactus saw the Spanish Conquistadors and missionaries crossing the desert here hundred’s of years ago…. Or, more recently, it could have been a movie prop in some of the old 4o’s Westerns that were filmed in this area (check out the ‘Westerner’ with Gary Cooper….or it could have been another actor, can’t recall off hand). It was filmed, possibly, right on these grounds! 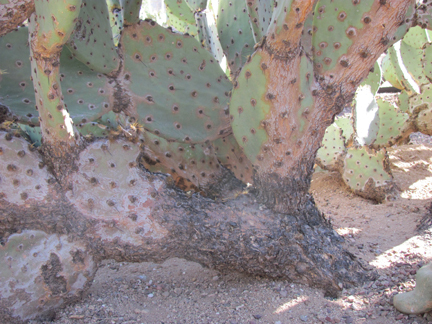 Most of the cactus in Todd’s backyard are varieties of prickly pear, and cholla. They grow more like trees…with knarly, barky trunks- certainly, a sign of extreme age! 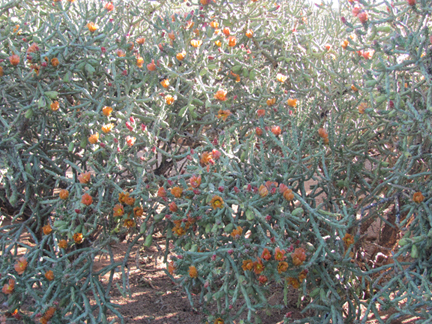 My bubble was burst last Friday, after talking to a botanist at the Desert Museum. 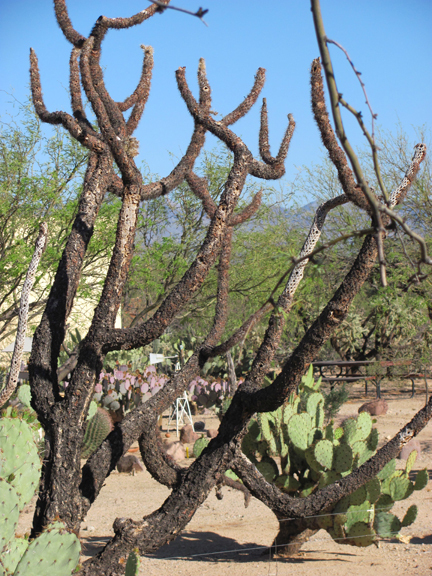 I learned that I AM OLDER than these barky, prickly, scarred old plants! Ugh! Here I hoped I would have a fantastic tale of ancient history to weave into a great post….But I did get this out of it…. I may be old, knarly and prickly, and have a bit of my own ancient history. But like the cactus, I still have a little blooming left to do! So funny! You look the same as you did in college! Hope things are going better for you…hang in there-but not in the cactus! Hee hee!….Wow, was I that prickly in college? 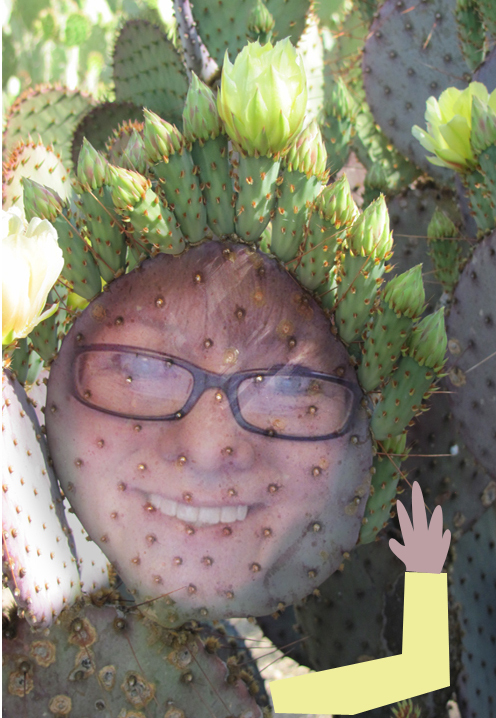 Rondi, you are so creative……..who else would see themselves in an ol’ prickly pear? It is so wonderful to find this site I feel like I’m back home.